The new building storage is on it’s way in FarmVille soon to be released the Unicorn Island. It’s a new great building that works like a Dino Lab and instead of placing Dinosaurs players will be placing their Unicorn collections inside it. 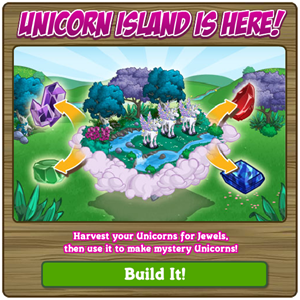 And when the Unicorn is placed inside the Unicorn Island harvesting it will give a chance to get random jewels that can be used in creating unique Unicorns. Players must be atleast level 15 to received this new feature building. We listed here all the Unicorn Island Gem list and how to get it and which animals produce the gems. Purple Amethyst, White Diamond, Green Emerald, Red Ruby and Blue Sapphire. What Unicorn gives what jewels? How to get a particular gems? 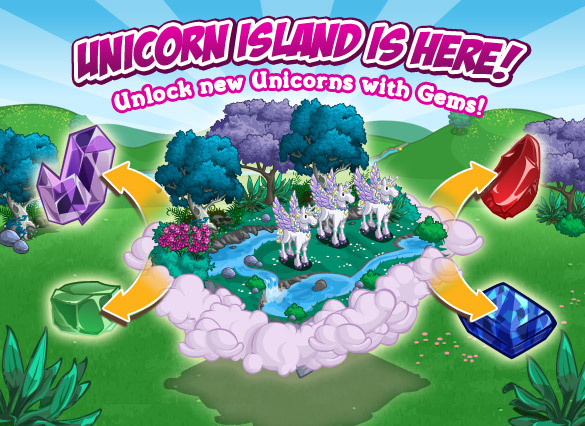 Remove all the Unicorn from the Unicorn Island and just leave the one that gives your desired gems. For example if you need White Diamond then your Unicorn Island must only have the Unicorns that gives White Diamonds like Moon Unicorn, Wind Unicorn, Moon Unicorn and Ballerina Unicorn. It is Unicorn specific. You can get Green Emerald from Princess Unicorn, Rainbow Unicorn, Icy Fire Pegacorn, or Moss Unicorn. Place any of these in a separate Unicorn Island to get 100% chance of getting a Green Emerald. Take out all of your unicorns except for your Moon Unicorn, and you will get White Diamonds every time. is there a list of which unicorns or pegahorns produce which gems ? According to the list above the Glass Pegacorn will give two different colour gems. This can’t be correct. We’re sorry 🙂 it’s supposed to be Icy Fire for the Green and Glass for the Blue Sapphire. They almost look the same though.